A 183cm tall female college student, Kohiruimaki Karen, has a complex about her tall figure and has a poor social disposition because of it. 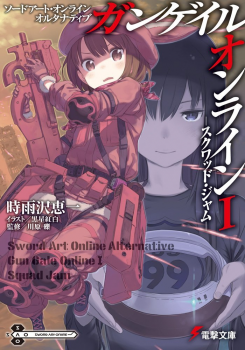 This was changed by the VRMMO game «Gun Gale Online» (GGO). In the game, Karen obtained a dream “chibi” avatar less than even 150cm in height, put on a full-body pink uniform and, as the player “LLENN”, frolicked around the world of GGO. An official spin-off of Sword Art Online supervised by Kawahara Reki, written by the gun supervisor of the Sword Art Online II anime, Sigsawa Keiichi (the author of Kino’s Journey), and illustrated by Kuroboshi Kouhaku.